Does the GI Bill even work? 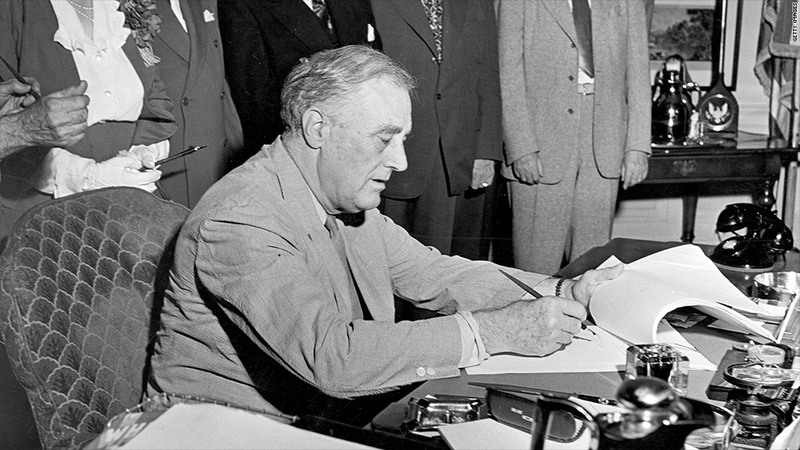 President Franklin Delano Roosevelt signed the GI Bill in June 1944. By 1947, veterans accounted for 49% of college admissions. Steve Brozak retired as a Lieutenant Colonel from the U.S. Marine Corps in 2004. He served on active duty and as a reservist for 22 years. He is a health care research analyst and health care investment banker. Over the last 12 months, failures in the VA health care system have dominated reporting about the Veterans Administration. But as tragic as these failures are, the Post-9/11 GI Bill has as big an impact on recently discharged veterans, and we have limited data about that program's efficacy. Today, there are close to 950,000 pre- and post-9/11 veterans in education and job training programs at a cost of more than $10 billion a year. Over the next few years, one million men and women will leave military service and will be eligible for educational benefits under the Post-9/11 GI Bill, which provides for a significant part of tuition, fees and books and offers an allowance for living expenses. By definition, these new veterans will constitute a nontraditional student body. Eighty-nine percent are under 34 years old, 56% are married and 45% have children. This generation of veteran students is much like the Greatest Generation that won World War II. In 1947, veterans accounted for 49% of college admissions. Under the original GI Bill, 7.8 million veterans participated in an education or training program. Back then, universities responded to the challenges of those "nontraditional students" by changing admission standards, acknowledging real world skills like management and adapting curricula to different learning paces. That is not happening today. Today, we are incapable of even controlling the cost of veteran student debt, let alone monitoring the quality of service being provided. In May, Sallie Mae, agreed to pay close to $96.6 million in restitution and civil penalties for illegal student loans. The loan servicer was accused of overcharging 60,000 active military members and then improperly seeking default judgments against the borrowers. As a retired Marine and a health care financial analyst, I know the lifelong impact of education. Much is at stake, for the nation and for individual veterans. Typical bachelor's degree graduates earn $1.19 million over the course of their careers -- twice that of typical high school graduates. We know there are problems with the veteran education programs. Very few veterans are admitted to prestigious universities. There is scant information on their graduation rates. There are few, if any, facts about the usefulness of a degree from a private for-profit school, though they are among the most popular for veterans. Most of all, few of our best universities are making the accommodations that are needed for today's nontraditional students to be accepted. The available data is not encouraging, especially in the area of nonprofit colleges. Of more than 10,000 campuses, 8,500 have fewer than 100 veterans enrolled. Among prestigious universities, the numbers are even more disappointing. In 1947, Princeton University reported 2,500 veteran students. Last academic year, there were 21. There are some bright spots. Columbia University's School of General Studies (my alma mater) now constitutes the largest veterans program in all the Ivy Leagues combined. Currently it has more than 350 veterans enrolled, which account for almost 20% of the program's student body. The school acts on its belief that these students bring a wealth of life experience to the classroom and contribute in a unique way to the diversity and cultural richness of the university. The Veterans Administration is now examining its own data to ensure that veterans -- and the government paying for their education -- are getting value for their investment. There are discussions to do a thorough review of graduation, retention, and transfer rates, which would provide valuable insight into the efficacy of the Post-9/11 GI Bill. In my experience, veterans are not looking for a handout; they are looking for a hand up. Their time in the service already puts them several years behind their peers when searching for a job and entering a career. The GI Bill should give veterans the opportunity to catch up with their peers. We owe it to them to gather the data, make the necessary adjustments to the program and make sure the bill for our veterans' education is worth the paper it is printed on.